The Rambler 35 Class principally dates from the early 1960s was designed by Jack Laurent Giles, one of the most influential English yacht designers of 20th Century. 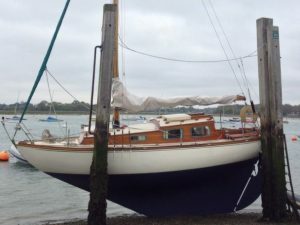 He designed many traditional sailing yachts such as the Vertue and Wanderer Classes as well as later production yachts including the Westerly range. The first of the Rambler Class was Rose Rambler built for Humphrey Barton in 1963 although CATSPAW, a specially commissioned design, by C H Kleinwort of 20 Fenchurch Street, London has the same principal dimensions and appearance of the later class. 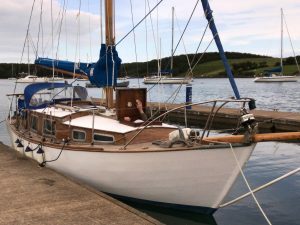 Burma Teak, one inch carvel planked hull, copper and bronze fastened to steam bent oak timbers and laminated frames, all to Lloyds 100A1 class. 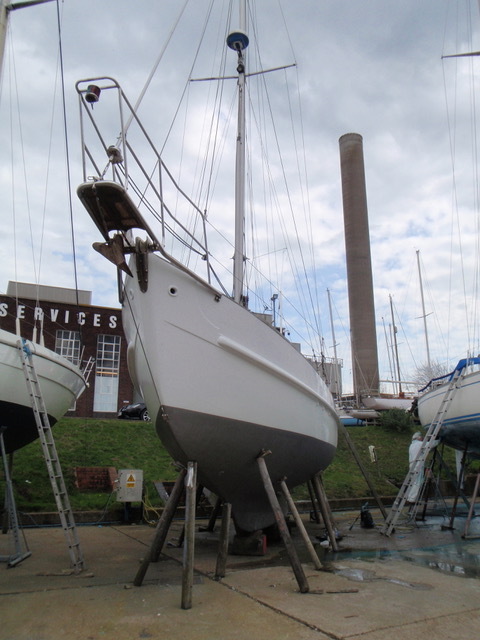 Aluminium bronze keel bolts fitted in 2001. Galvanised strap floors replaced in 2001. Teak laid decks, teak coachroof coamings and cockpit. Lead ballast keel. Traditional accommodation for six with original teak and mahogany joinery. Full headroom. Double berth fore-cabin, twin berth aft cabin and port and starboard settee berths in the saloon. Stainless standing rigging, replaced 2001. 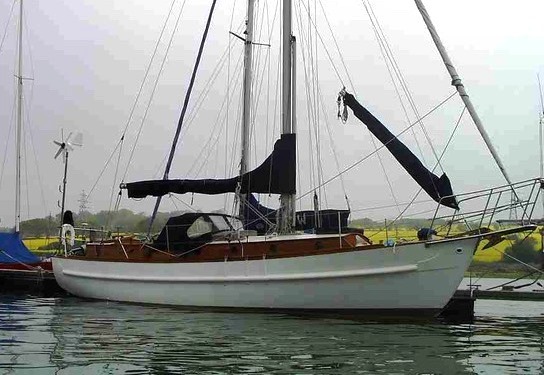 Fitted with staysail boom and backstays for heavy weather sailing. Stainless steel bowsprit and platform. Jeckell Sails using highest quality sailcloth available (U.S. 8 oz. Marble head). 1x, No1 Genoa, as new. 1x, No2 Genoa, as new with wire luff. (Can be gull winged). 1x Staysail, as new, hank on, with reef points, on boom. (can be removed for local sailing). 1x Mainsail ,as new, fully battened with 3 slab reef points. 1x large red and yellow cruising chute. All above sails in excellent first class condition and carefully stored. Plus 1x Spinnaker in poor condition. 4 cylinder Mermaid Ford OHC. Diesel engine with 1100 Hrs use, Condition good. Hydraulic forward reverse, overhauled 2009 with 50Hrs since rebuild and new drive cushion plate. Condition good. System electrics all 12 Volt DC. Dual option engine starting batteries. Separate house batteries, can be linked to engine batteries in emergency. Vessel recently rewired in 2009 with new custom D.C. switch control panel. Traditional classic yacht lighting fixtures fitted with LED light bulbs, for economic consumption of power. Wind generator, capable of charging either bank of batteries. Engine high output alternator capable of charging 1 or both battery banks. 12 Volt water pressure system. Raymarine electronic flux gate compass. ACR 406 MHz Satellite EPIRB (battery not in date). Kenwood C.D. AM FM Stereo player. Radar reflector top of mast. Double berth forecabin with under berth storage, re-upholstered 2007. Fitted with bronze port lights and traditional look brass light fixtures. Heads Compartment fitted with traditional Blake bronze sea toilet, recently replaced bronze seacocks. Hand washbasin with lockers and pressure water supply. Hanging foul weather gear area. Heavy duty traditional deck vent and glass light. Beautiful new heavy duty Teak deck hatch fitted with traditional hardware and “”pineapple’ type glass deck light. Saloon fitted with table and surround three sides upholstered 2007, seating with storage under. Locker storage above. Nav station on Stbd forward side with galley Stbd aft side. Fitted with traditional bronze port lights and deck mushroom vents. 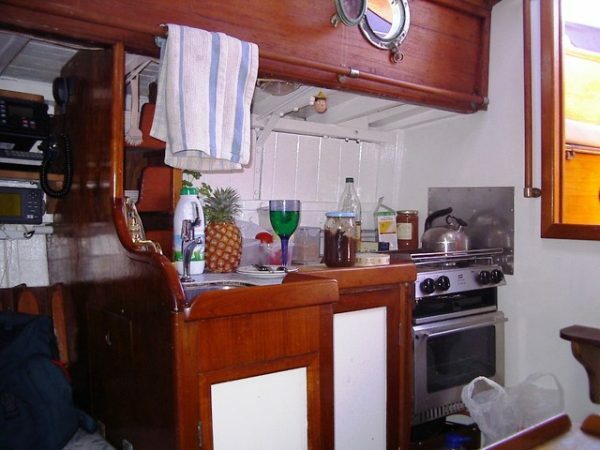 Galley fitted with worktop with storage lockers under. Sizeable refrigeration fully insulated cold box under worktop with top access drop in lid. Two burner propane stove and oven replaced in 2009. Deep stainless sink fitted with pressure water and back up traditional bronze hand pump. 100 Litre fresh water flexible heavy duty custom water storage tank. Beautiful teak construction fitted with traditional teak rimmed steering wheel and pedestal. Steering controlled by reliable cable with renalds chain at steering head. Also back up tiller assembly, which fits, directly to top of rudder through deck fitting. Heavy duty spray dodger, and full cockpit cover fitted new in 2012. Can be used as extra room when weather is wet. New over boom type awning for hot or wet summer days. Storage lockers under, propane storage, and hand whale bilge pump. Custom removable dining table fits to Teak steering pedestal fitted with good quality magnetic steering compass. Speed log, Depth sounder, Flux gate compass readouts. Radar mounted to be visible in Cockpit or can be swung in to be monitored from Saloon. Under cockpit fitted with 2x 210 Litre Diesel tanks. 1x Heavy duty 12 Volt Rule high capacity auto bilge pump. New 1 ½” top quality custom propeller shaft machined to be reversible when needed. Fitted with new cutlass water lubricated bearing, matched three blade phosphor bronze propeller, and “”Spurs’ rope cutter. 2x berths with storage under and locker. Fitted with traditional bronze port lights. Traditional style brass lamps fitted with LED light bulbs. Access to stern shaft gland. Hydrovane self steering system for long passage making fitted and available if required. Avon 4 man valise type, in good condition, (no current inspection cert). 200 Mtrs 10mm anchor chain. Avon inflatable, transom type dinghy in very good condition. Yamaha 4 HP out-board motor in very good condition, always flushed after use, available if required. The diesel engine drives vessel like a tug boat with plenty of power to spare, but is also very economical to run, with a long range under power (2 Imp Gallons per hour at 2,500 RPM) equates to approximately 50 Hrs per refill at 6-7 knots resulting in approximately 300 miles range under engine power. 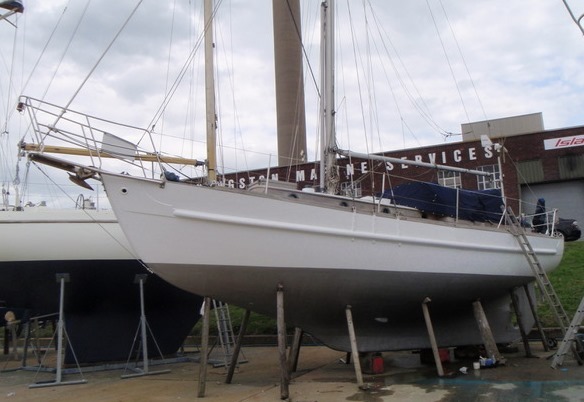 A most attractive and appealing Laurent Giles designed cruising yacht, the subject of much expenditure and offered in good order throughout. A capable passage maker and weatherly vessel currently ashore ready for commissioning this season. 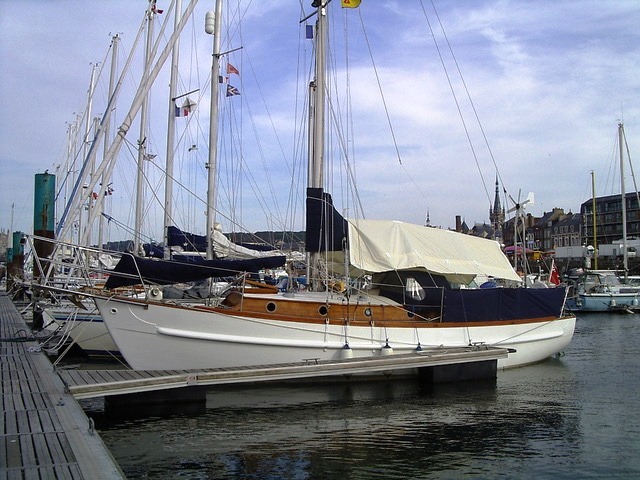 Regularly cruised to the West Country, Channel Islands, Scillies and many French Ports. Original design drawings available together with the builders specifications and past history. 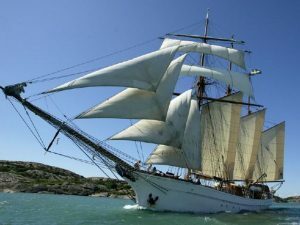 With a safe centre cockpit Catspaw is ideal as a family boat and with her comparitive shoal-draught very suitable for East Coast cruising.